A 49-year-old male patient with a prior history of poor compliance with medical appointments was referred for an 18F-fluoro-2-deoxy-D-glucose (18F-FDG) positron emission tomography/computed tomography (PET/CT) for the staging of a rectal squamous cell carcinoma. The PET/CT showed unilateral diffuse skeletal muscle 18F-FDG uptake as well as bilateral salivary gland uptake artifacts, suggestive of non-compliance with patient preparation instructions. The PET/CT nurse noted that during the 18F-FDG uptake phase, the patient appeared intoxicated, and she found two beer cans hidden in the waste disposal beside his chair just prior to imaging. 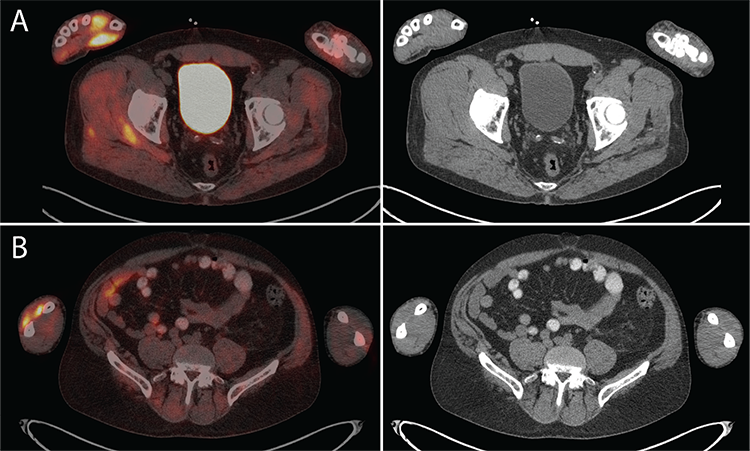 The patient only admitted to eating a cookie approximately 30 minutes after the injection of 18F-FDG PET/CT and denied consuming alcohol during the uptake phase. We present the imaging findings of non-compliance with patient instructions during the uptake phase of 18F-FDG. Surgical and Medical Practices: W.M., E.W.H., Concept: W.M., Design: W.M., Data Collection or Processing: W.M., E.W.H., Analysis or Interpretation: W.M., E.W.H., Literature Search: W.M., E.W.H., Writing: W.M. 1. Cook G, Wegner EA, Fogelman I. Pitfalls and artifacts in 18FDG PET and PET/CT oncologic imaging. Semin Nucl Med 2004;34:122-133. 2. 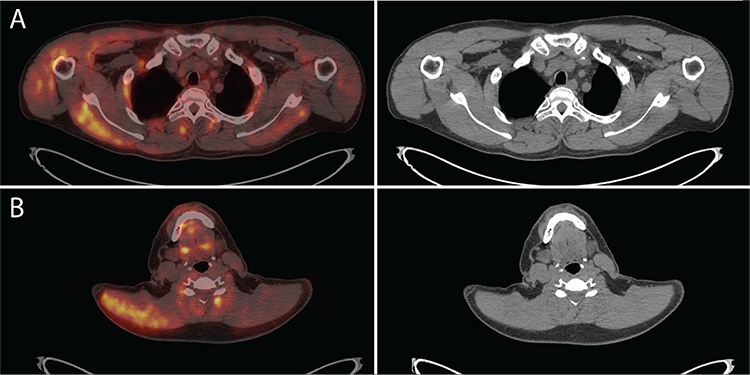 Rosenbaum SJ, Lind T, Antoch G, Bockisch A. False-positive FDG PET uptake – the role of PET/CT. Eur Radiol 2006;16:1054-1065. 3. Yasuda S, Ide M, Takagi S, Shohtsu A. Elevated F-18 FDG uptake in skeletal muscle. Clin Nucl Med 1998;23:111-112. 4. Choi BW, Kim SH, Kim HW, Won KS, Zeon SK. Hypermetabolism of skeletal muscles following sexual activity: a normal variation. Nucl Med Mol Imaging 2010;44:228-229. 5. Bai X, Wang X, Zhuang H. Long-lasting FDG uptake in the muscles after strenuous exercise. Clin Nucl Med 2015;40:975-976. 6. Blodgett TM, Mehta AS, Mehta AS, Laymon CM, Carney J, Townsend DW. PET/CT artifacts. Clin Imaging 2011;35:49-63. 7. Kawabe J, Higashiyama S, Okamura T, Torii K, Koyama K, Kawamura E, Ishizu H, Inoue Y, Shiomi S. FDG uptake by tongue and muscles of mastication reflecting increased metabolic activity of muscles after chewing gum. Clin Nucl Med 2003;23:220-221. 8. Lin FI, Foster CC, Hagge RJ, Shelton DK. Extensive FDG uptake in accessory muscles of respiration in a patient with shortness of breath. Clin Nucl Med 2009;34:428-430. 9. Costelloe CM, Murphy WA, Chasen BA. 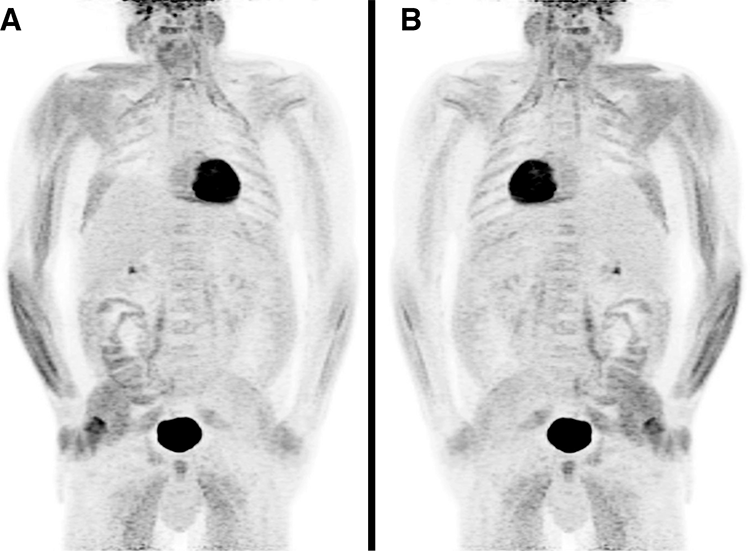 Musculoskeletal pitfalls in 18F-FDG PET/CT: pictorial review. AJR Am J Roentgenol 2009;193(Suppl 3):WS1-WS13. 10. Love C, Tomas MB, Tronco GG, Palestro CJ. FDG PET of infection and inflammation. Radiographics 2005;25:1357-1368. 11. 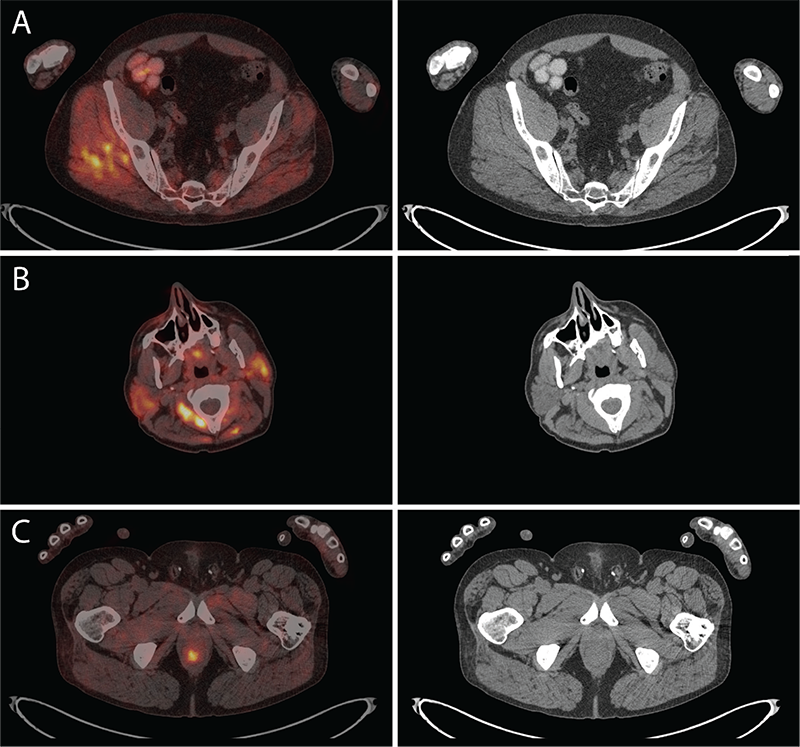 Tomita H, Kita T, Hayashi K, Kosuda S. Radiation-induced myositis mimicking chest wall tumor invasion in two patients with lung cancer: a PET/CT study. Clin Nucl Med 2012;37:168-169. 12. Mahmood S, de Llano SRM. 18F-FDG PET detection of unknown primary malignancy in dermatomyositis. Clin Nucl Med 2012;37:e204-e205. 13. Strobel K, Stumpe KD. PET/CT in musculoskeletal infection. Semin Musculoskelet Radiol 2007;11:353-364. 14. Palestro CJ. FDG-PET in musculoskeletal infections. Semin Nucl Med 2013;43:367-376. 15. Nakatani K, Nakamoto Y, Togashi K. Unilateral physiological FDG uptake in teres minor muscle seems well associated with IV tracer injection procedures. Clin Nucl Med 2015;40:62-64. 16. Gupta P, Kota G, Alavi A, Mintz A. Unilateral diffusely increased muscle uptake of F-18 FDG in a patient with hemiparesis due to stroke. Clin Nucl Med 2011;36:1140-1141. 17. Rudroff T, Kindred JH, Koo PJ, Karki R, Hebert JR. Asymmetric glucose uptake in leg muscles of patients with multiple sclerosis during walking detected by [18F]-FDG PET/CT. NeuroRehabilitation 2014;35:813-823. 18. Lin EC. Focal asymmetric longus colli uptake on FDG PET/CT. Clin Nucl Med 2007;32:67-69. 19. Schwartz P Jr, Pinaquy JB. Unilateral forearm muscle 18F-FDG uptake after using a smartphone. Clin Nucl Med 2015;40:e532-e533. 20. Jackson RS, Schlarman TC, Hubble WL, Osman MM. Prevalence and patterns of physiologic muscle uptake detected with whole-body 18F-FDG PET. J Nucl Med Technol 2006;34:29-33.